Disability advocates have slammed the Abbott Government after it placed an advertisement to replace the board of the agency that runs the National Disability Insurance Scheme without informing the current directors. 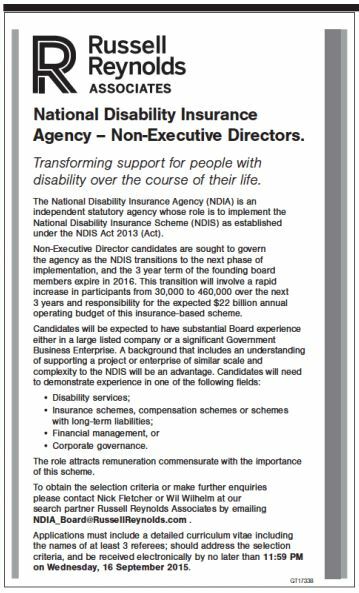 According to the ad placed in today’s Australian Financial Review, the Government is looking for Non-Executive Director candidates to govern the National Disability Insurance Agency as the $20 billion NDIS transitions to the “next phase of implementation”. It says that candidates will be expected to have substantial board experience either in a large listed company or a significant Government Business Enterprise. It is understood that none of the current board members, including Chair Bruce Bonyhady, were notified that the advertisement would be placed. Bonyhady has previously served as President of Philanthropy Australia, Deputy Chair of the National Disability Insurance Scheme Advisory Group to the Council of Australian Governments, Chairman of Yooralla and has held senior positions in the funds management industry and insurance industry in Australia and internationally. However he would not meet the criteria specified by the Government in its advertisement. It comes a month after it was revealed that the Government was planning on replacing the NDIA board members with people who had served on the board of ASX50 companies. Assistant Minister for Social Services, Senator Mitch Fifield, has since denied that the current NDIA board members were not informed of the advertisement for their replacements. "The board members were advised yesterday that ads would be appearing today, and were also advised that I’d be writing to them to invite them to be a part of the process if they had an interest in continuing to serve on the board. I also wrote to the chair of the NDIS board about six weeks ago outlining the process that we would be going through," Senator Fifield said. "I have the highest opinion of each member of the board and I have an open mind in relation to the ongoing contribution of each individual board member. What we’ll ultimately do is to look at the combination of skills that applicants possess, both those that might continue on the board, and those who will be coming onto the board for the first time." Senator Fifield also said that the new Board would be comprised of people who have a longstanding experience in the disability sector, which he said was enshrined in the NDIS Act. President of People With Disability Australia, Craig Wallace, told Pro Bono Australia News that sector was being kept in the dark about the possible shakeup of the NDIA. 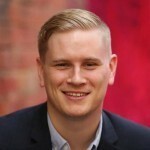 Wallace said the Australian Cross Disability Alliance, of which his organisation is a member, had written to the Abbott Government outlining its concerns and had not received a response. “We’re obviously quite concerned about reconstituting the NDIS Board without consulting with the sector,” Wallace said. “The fact is that people continue to be alarmed by talk and cabinet leaks about possible delays or deferrals or funding cuts to the NDIS. “People have been waiting for this scheme all their lives. Some of them have been waiting for over 40 years and are really close to the age cut off. “Every time that we talk about shaking up the governance of the NDIS or possible delays or other surprises, then people with disability and their families get quite alarmed and quite concerned that they might be about to lose some of the services that they’ve fought a very long time for. Wallace said his organisation was not opposed to a shakeup of the NDIA but that any new board needed to include people who had a deeper understanding of living with a disability. “We certainly want people with the ability to run a large financial undertaking, which is what this is, but that’s not all it is,” he said. “The NDIS is not like running Westpac, ANZ or a large general insurer. It is also providing services to people with disability and reengineering a social service system. These people will really need experience and expertise, including lived experience of disability and caring roles and to know what is involved in receiving those services, and we want to see that reflected in the board. Wallace called on Prime Minister Tony Abbott to publicly commit to delivering the NDIS in full and on time.